A classic Hooping move is to lift up the Hoop from the hips toward the neck. Basically, it is quite a simple technique to let the Hula Hoop move upward on the body. It is not about to stand on tiptoes or to transport the Hoop with thoughts upwards. You simply have to begin to make great and sweeping circular movements with your hips. In order to move a Hula Hoop up against gravity, you must make larger movements below the Hoop than above it. Once the Hoop is moving up, the larger hip movement must also move upwards. It is certainly a good idea to practice these larger hip movements initially without the Hula Hoop. You can stand in the middle of the Hula Hoop and try to make a circular movement with hip and belly that goes on the floor over the edge of the Hoop. Or imagine you had a pencil at the hip with which you are drawing a large circle. Imagine a cone in front: your hips drag along the ground and the head stays at the top left (see figure). Once you make larger movements, the Hoop is moving up the body. You must ensure that you press the body against the Hoop all the way, i.e. on the sides, in front and especially at the back. This area is generally the weakest since we cannot see what is going on behind our back. Therefore, you really need to be sure to also press the back enough. The Hula Hoop will tend to adapt to all natural body shapes during the upward move. The starting point is the lower back, then toward the lower chest to the shoulder blades. The size of the circular movement should increase slowly until the Hoop begins to move upwards. Once the Hula Hoop is moving up, the great and circular movements of the hips will be replaced. When the Hoop is approaching the chest, it will tend to migrate down when you are working against your body shape. If you already have a good control of the chest, then this will not be a problem. But even without this control, you can learn the technique. In order to control the Hoop as good as possible, you should be able to anticipate his way up. If the Hoop approaches the first arm, let it fall down and the lowered shoulder will be moved into the Hoop. Straighten up when the Hula Hoop moves around the neck. This will help to lift the Hoop gently through the last stage of the journey upwards. 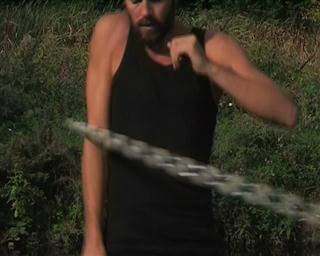 Bring now the second arm into the Hoop and level the shoulder to start with Neck Hooping. 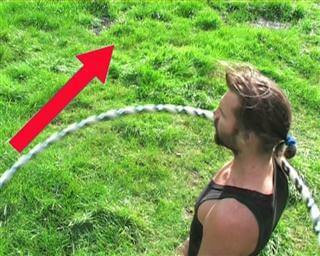 Start with Hooping movements around the neck. You must decide which arm you want to move first. Most people will instinctively move their strong arm, but that is not necessarily the best idea. 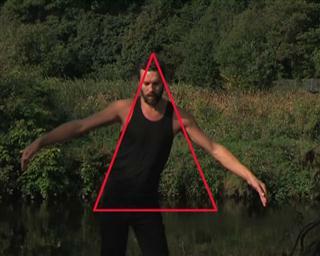 In this situation, the "better" arm depends on the direction in which you run the Hooping movements. If you look down on the Hula Hoop and it moves clockwise, the right arm surely is the better solution. Should it move counterclockwise, then the left arm is the better choice. Right-handed persons tend to Hula Hoop counterclockwise. 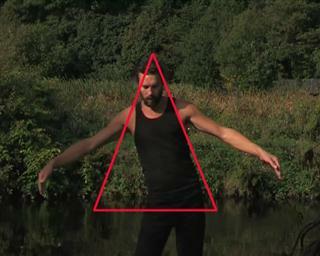 They also want in most cases to raise the right arm up first, although this is actually the more difficult way. Important are mainly a good timing and an appropriate assessment. It is easier to see the space and estimate the timing when the Hoop flies in front of the body. Once the first arm is fully in height, you should start with the second arm, the timing should be good in this case. Once both arms are up, the Hula Hoop is sagging downward. In order to catch the Hoop on the hips, you must make sweeping hip movements. 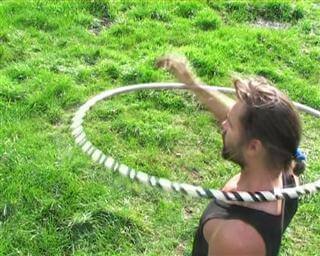 If you make such rather sweeping circular movements with the hip, the Hoop should fall by itself in the right timing. You should now be able to move the Hula Hoop from the neck to the base position around the waist. This is a movement that allows you move the Hula Hoop from the waist to the neck. 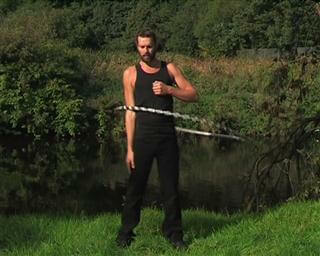 It works by moving up the Hoop with short, alternating arm lifts within the Hula Hoop. First, you must therefore get used to perform Hula Hooping with one arm outside the Hoop. It may seem difficult to get the arm into the Hoop. But you remember the previous movement and use the same arm that you raised first. This arm will be called arm 1. You should test yourself and find out whether it is the right or left arm. So you move arm 1 into the Hula Hoop and hold it on the side. Proceed as usual with Hula Hooping. Try not to give the Hoop with your arm strength or momentum. Take a little time to get used to it that you keep an arm in the Hoop. If the Hula Hoop always falls down when you move your arm into it, it may be that the Hula Hoop is below the elbow. Hula Hoops love support. If the elbow is below the Hoop, it will tend to get stuck on you. If the elbow is above the level of the Hoop, it has no support and will tend to move downwards. 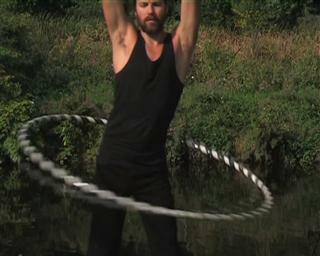 If you make yourself familiar with Hooping with one arm inside, you can try to lift one arm. Once the Hoop is in contact with your arm, you should sharply pull your shoulders upwards. Making sure that the Hoop is not removed from the body. It can help to keep your thighs loose when you pull your shoulders up. This creates a clean upward movement and the Hula Hoop movement is not affected. You should feel the Hoop rises a little although it will quickly slip back down. Once this works, you are ready for further moves. With each lifting of the Hula Hoop, it should move upwards until it has arrived at the neck. Once arrived there, keep it going with side to side movements. This may take some practice, but if you stick to that, it should be possible quickly. When learning the technique, not few Hoopers find it hard not to move the arms. This intuitive movement is not helpful. It is really important to focus on clear lifting movements of the shoulder.